But Obama should just keep talking—until he has a chance to make a deal with a new president not named Ahmadinejad. Both sides seem to want a deal in the talks between Iran and the P5+1 that started today and continue through Saturday in Almaty, Kazakhstan. But they ain’t there yet, and chances are there won’t be a deal this time, or next time, until after the conclusion of what promises to be a contentious election for Iran’s next president on June 14. So stay tuned. And, Mr. Obama: Stay calm and keep talking. By now, everyone knows what a deal would look like. The United States and its partners in the talks would acknowledge that Iran has the right to enrich uranium to 3 percent-purity, fuel-grade quality on its own soil, and the P5+1 would allow sanctions imposed by the United Nations to expire. (Whether the United States keeps its unilateral sanctions in place is another question, and Obama would have to push Congress hard to end those, too.) In response, Iran would pledge not to enrich beyond 3 percent, and it would allow the UN’s International Atomic Energy Agency to intensify its inspection protocol indefinitely to assure the world that Iran isn’t militarizing its uranium enrichment program. Such an accord would probably take several steps, and it wouldn’t be completed for a year or two. In the meantime, it’s clear that Obama and his new national security team, including Secretary of Defense Chuck Hagel, have zero appetite for war with Iran. Sorry, Bibi. "There were some interesting but not fully explained general comments on our ideas," one of the diplomats said. "We have insisted on a second plenary this afternoon…so that they can respond in the kind of detail that will enable us to make progress." 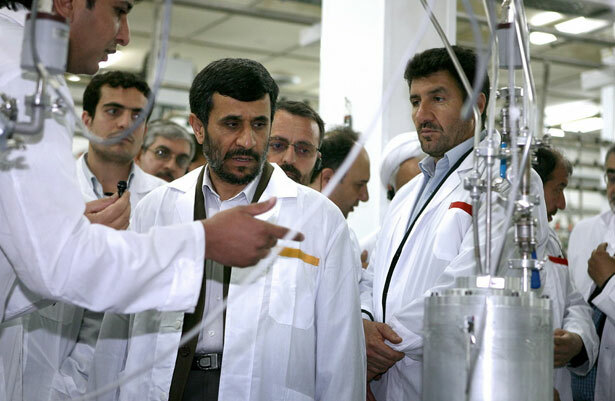 With Iran's presidential election approaching in June, Iran appears to be keeping its stockpile of 20 percent-enriched uranium below the roughly 250 kilograms that experts say would be enough to produce one atomic bomb. Iran has done so by converting some of that stockpile into fuel plates to power Tehran's research reactor, the IAEA has said. Fissile material in this form is difficult to use in a weapons program, US and European officials say. The P5+1 would also offer civilian nuclear cooperation, including providing fuel for an aging research reactor in Tehran—which requires 20 percent-enriched uranium for fuel—as well as IAEA technical help with acquiring a modern research reactor, safety assistance and supplying of isotopes for nuclear medicine. The US would further “license safety-related inspection and repair in Iran for Iranian commercial aircraft” bought years ago from American plane-makers. But a major sticking point, still, is Iran’s insistence that sanctions be lifted, and not just on a few limited items such as petrochemicals and gold. "We believe a long-term settlement should be based on the recognition of Iran’s unconditional right to develop its civilian nuclear program, including the right to enrich uranium” provided that all nuclear activity is put under supervision of the International Atomic Energy Agency, Mr. Morgulov told the Interfax news agency. President Obama knows that, too. Iran may not be able to make the deal before its elections in June, but that will make it easier for Obama, too. Why? Because the ostensible leader he makes the deal with, the next president of Iran, won’t be named Ahmadinejad. Will Chuck Hagel reign in defense spending, or is it just rhetoric? Robert Dreyfuss comments on the secretary's speech.